Casual dining, you ask? Yes. But with a twist! That’s Society Café Encore, located inside the latest addition to the Strip: Steve Wynn’s signature collection hotel, Encore, which houses some of the most talked about restaurant openings in recent culinary history. Among them is Café Society Encore, which is led by Executive Chef Kim Canteenwalla in partnership with wife Elizabeth Blau, as well as several other hospitality luminaries, including Sean Christie, Oliver Wharton and, of course, Steve Wynn. Together, this team has transformed the simple “all night eatery” into an all-night affair to remember. No stranger to Wynn, Chef Canteenwalla previously served as executive chef for the casino icon at Beau Rivage in Biloxi, Miss. Wife Elizabeth’s name, meanwhile, is synonymous with some of the most talked about, popular restaurants in the city. 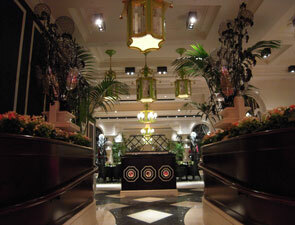 It’s no surprise, then, that Wynn turned to this couple to provide the hippest casual dining experience on the Strip. Together, their company, Blau & Associates, has launched some of the world’s best five-star hotel projects. Although it’s casual, Society Café’s menu is definitely deserving of the Blau & Associates name. Creative with a flair, it even includes a section called “Sticks, Picks & Finger Food” made expressly for sharing. That section and others are full of Chef Canteenwalla’s twists on old favorites. The restaurant, which was inspired in design by the days of Oscar Wilde, is a fanciful confluence of hot pink, lime, white and black -- a very modern interpretation of Victorian times. Sporting a perfect view of the casino and offering guests the ability to have a power breakfast, business lunch, fun dinner or just snacks after a day at the pool, Society Café provides something for everyone, vacationers and locals alike!